All that's left of the Hanes briefs Eric and Amanda Volsen buried in one of their fields this summer is the waistband. They've joined several southern Minnesota farmers who have found one creative way to test how healthy their soil is: In July, they dug holes in their corn and soybean fields, dropped in pairs of cotton underwear, and checked back a couple months later to see how well the briefs decomposed. 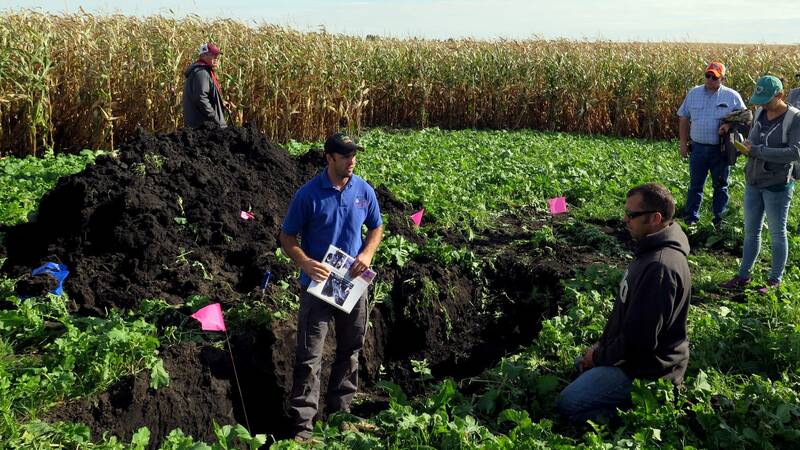 Farmers who joined the program, dubbed "Soil Your Undies," gathered Monday on a field in Faribault County to share their results. 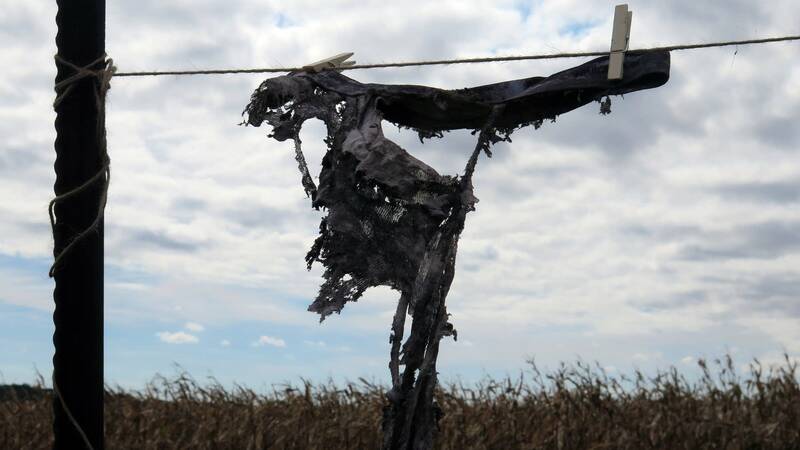 Burying underwear in a field isn't exactly a scientific test of soil health, and it doesn't always work. Most of Monday's event focused on other signs of soil health, like evidence of worm activity. But farmers have found burying underwear is a fun way to raise awareness around the importance of soil health. 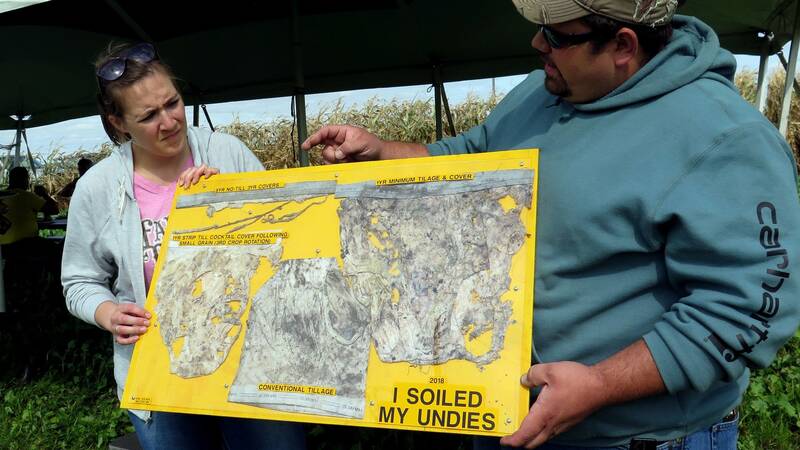 The Volsens, who grow corn and soybeans near Walters, Minn., proudly plastered the underwear remains to a bright yellow board with a Plexiglass cover and labeled it with the type of farming practices they used on the field it was buried in: no-till for five years. Most Minnesota farmers in southern Minnesota still till their fields, ripping up the soil after the fall harvest and before the snow flies, leaving behind a dark landscape free of plant residue. "The blacker the better, is what I was always told," Eric Volsen said. But a movement afoot in soil-health circles suggests that tilling is unnecessary — and actually makes the soil less healthy. Volsen has also been planting cover crops for three years in the field where he buried those disintegrated undies. 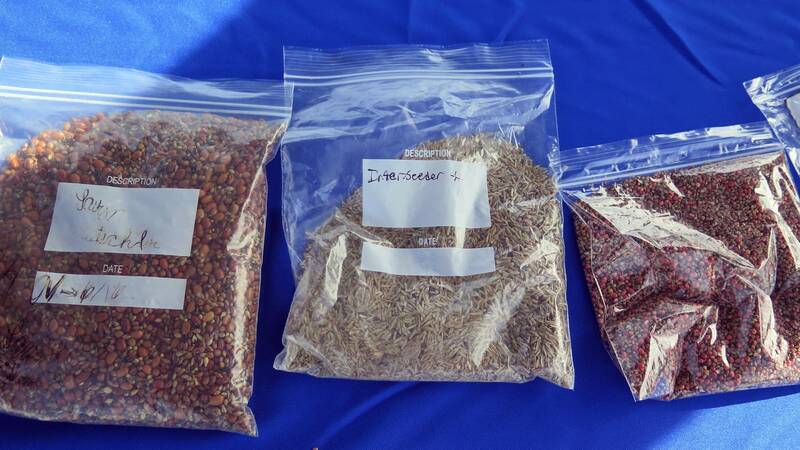 Cover crops — like rye grass and clover that are planted alongside cash crops like corn and soybeans — have been gaining attention because they increase the number of plants and organisms growing in the soil, adding nutrients. They also keep it intact, protecting it from erosion. The Volsens and their four kids buried cotton underwear in other fields where they use other practices. They wanted to see if conservation practices actually helped their soil make the underwear decompose faster. The results? In the conventional field — the one without cover crops and where the soil has been tilled a lot over the years — the buried briefs remained almost completely intact, despite spending two months underground. "That contrast is very eye-opening to me," Eric Volsen said. The Volsens have both pairs of underwear in their underwear display. They've concluded that it's worth the extra effort of planting cover crops and that skipping the tillage can provide multiple benefits — healthy soil, less labor and less fuel costs. "I was really happy to see that what he is putting into practice is seeing results," Amanda Volsen said. At the field day in Easton on Monday, farmers gathered to discuss the conservation practices they're using in their fields. Nathan Carr, who organized the event and the Soil Your Undies challenge this summer, said a focus of the program is to connect nearby farmers to discuss their practices. 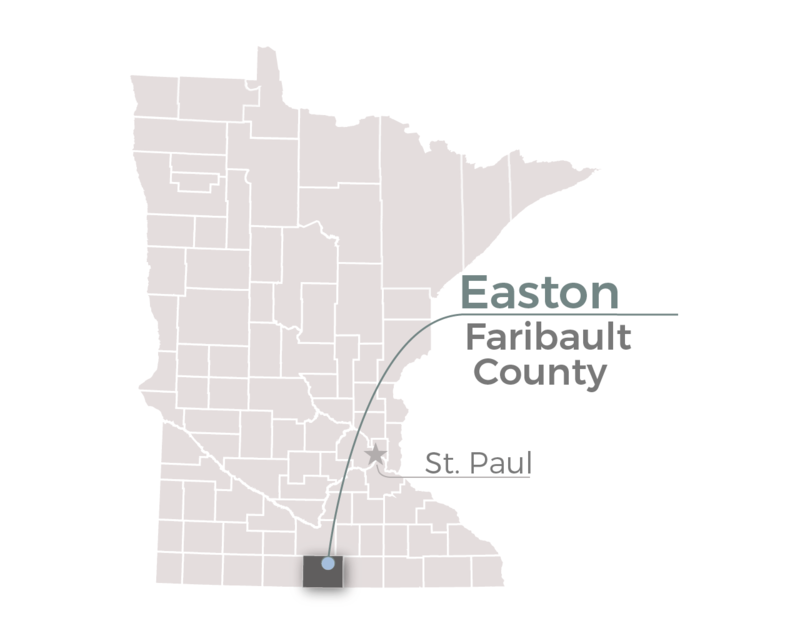 He works with the Faribault County Soil and Water Conservation District, the local office that helps promote reduced tilling and cover crops that improve water quality and soil health. "Our goal is to have them ask farmers who are already doing it in the same area have a conversation and then maybe they try 80 acres. We want to highlight the good stuff people are doing." Farmer Joel Rauenhorst, a retired F-18 fighter pilot who came home to work the farm where he grew up, hosted the gathering. Rauenhorst's dad used a practice called strip till — a reduced tillage technique — long before he did, and now he's trying to take soil health to new levels by planting cover crops. Turnips and radishes have taken over next to his corn field, where the smaller plants grow in between the rows of corn. "To me, the biggest challenge is [that] you just have to commit to it," he said. "This is a paradigm shift that just a lot of people are not willing to take." Rauenhorst also took the underwear challenge this summer. The tattered remains of a pair of Fruit of the Loom briefs now hang in the wind, right next to his driveway.